This new textbook for students of social theory considers the role of public intervention in social and economic processes. It is a clear, critical discussion of different theoretical and political perspectives on social policy. Barry Hindess begins with the ‘consensus’ view, shared by senior politicians, civil servants, and academics throughout much of the postwar period. This view depends on two beliefs: in the capacity of government to manage the economy; and in the development of a qualitatively new relationship between the state and the population. The first is discussed in relation to Crosland’s The Future of Socialism, and the second in relation to Marshall’s conception of citizenship and Titmuss’s account of social policy. The consensus view generated serious objections, and Hindess examines two in particular. One is the argument that the view itself causes a destructive, competitive struggle between sectional interests for state intervention in their favour. The other, from the left, is that what Tawney called ‘the strategy of equality’ has failed, and that a more radical attack on inequality is required. The remaining section looks at the Marxist and liberal alternatives to the consensus view. In conclusion, the author discusses firstly the essentialism of the market both in consensus and (in very different ways) in liberal and Marxist thought; and secondly the place of principles such as freedom and equality in political discussion and the analysis of social conditions. He shows that market and plan are not necessarily incompatible. 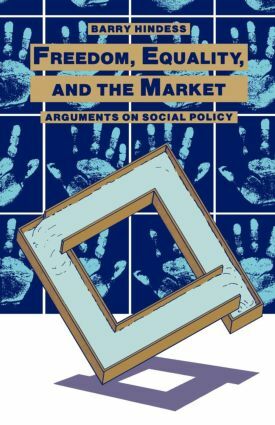 Freedom, Equality, and the Market, with its careful assessment of the key texts, will be important reading for undergraduate students of sociology and social policy.